Charles Buchinski born on November 3, 1921 in Ehrenfeld, Pennsylvania. Though the only one of 15 children to finish high school, Bronson worked in the coal mines alongside his brothers to support the family. Born to Lithuanian immigrant parents, he served during World War II as a tailgunner, then used his G.I. Bill to study art in Philadelphia and, intrigued by acting, enrolled at California's Pasadena Playhouse. An instructor there introduced him to director Henry Hathaway, which resulted in his debut film role in You're in the Navy Now. Bronson has two children with his first wife, Harriet Tendler. He married actress and producer Jill Ireland in 1958, who had two sons with her first husband, David McCallum. One adopted son (Jason) died in 1989. He and Ireland had a daughter named Zuleika. Ireland died in 1990. Bronson married his third wife, Kim Weeks, in December, 1998. On August 30, 2003 Charles Bronson died of pneumonia in Los Angeles. He was 81. The role of Bernardo, one of the The Magnificent Seven, that Bronson's career took off. Subsquent roles in The Great Escape in 1963, where he played claustrophobic tunnel-digger Danny Velinski, and The Dirty Dozen in 1967 solidified his status. Bronson spent the next few years in Europe, where he became a box-office draw with such films as Alain Delon's Adieu l'ami and Sergio Leone's classic Once Upon a Time in the West, both in 1968. He return the United States where true stardom evaded him until 1974, when Michael Winner directed him in Death Wish, a revenge fantasy about an architect who turns vigilante when his wife and daughter are raped. The movie was both controversial and extremely popular (and spawned four inferior sequels in 1982, 1985, 1987 and 1994). It also established Bronson as a celebrity in his own country and set the tough, cold, violent persona that made him a film icon. Some exceptions include Hard Times in 1975, where he played a 1930s streetfighter and the 1976 offbeat black comedy From Noon Till Three. However, Bronson was drawn to action-thrillers like Breakout in 1975 and Love and Bullets in 1979, as well as the super-gory Ten to Midnight in 1983, The Evil That Men Do in 1984 and Kinjite: Forbidden Subjects in 1989. 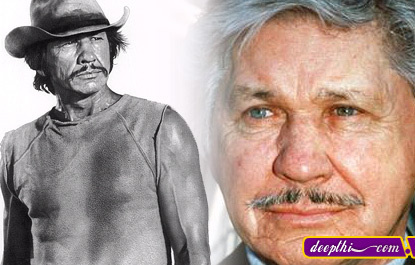 Bronson's TV work included such movies as Raid on Entebbe in 1977, Act of Vengeance in 1986, The Sea Wolf in 1993, and Sean Penn's The Indian Runner in 1991.